Project funded by The William J. Clinton Foundation – Clinton Health Access Initiative (CHAI) piloted a four month participatory theatre programs at Chitoor and Tirupathi ART Centre to increase HIV/AIDS awareness as part of their Balashyoga (BSY) program. 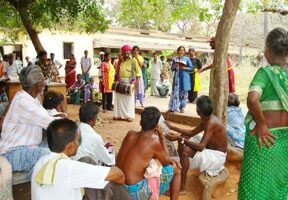 Nalamdana, with its expertise in participatory theater, was identified to implement this short term project (June – September, 2010). This pilot program may serve as a model for implementing this program at other ART centers. Nalamdana conducted a five day theatre workshop at Tirupathi to train a team. The workshop comprised of pre-play entertainment tips; basics of theatre, street play formats, theatre exercises, tips on dialogue delivery and acting and sensitization to the issues, so that they can handle post drama questionnaires and post play discussions. In continuation of the theatre workshop conducted by Nalamdana during July 2010 at Tirupathi for a team of 20 participants, theatre performances were performed in the ART centers at Chittoor and Tirupathi. During the month of October the remaining 8 plays were performed. A total of 9 plays were performed at each site from September to October 2010. So a total of 18 role plays were completed within a time frame of three months. About 1000 patients were reached through these 18 performances at both Chittoor and Tirupathi ART centers. The role plays were performed during the morning hours of the O.P, and on an average 50 – 60 patients comprised of men, women and children were covered per performance. The role play addressed key issues on the importance of ART adherence, usage of condoms among the concordant and discordant couples and services of BSY. As an enhancement to these performances, Nalamdana recommended Clinton Foundation to incorporate the “Public Addressing system” as a component to this program. A proposal for the same has been submitted along with the final narrative report and is likely to be approved by January 2011. The Clinton Foundation has funded Nalamdana to create and execute special Drama training for targeted youth at their project site in Tirupathy and Chitoor, where ART patients access free treatment. As Nalamdana’s senior trainers are also the creative producers of the programs at Tambaram, this team have identified and trained village actors from May – June 2010. The trained teams will perform at the ART centers to reach crucial messages to out patients, monitored by Nalamdana. This is the first time Nalamdana has trained and expanded their work outside the state, in another Indian language.